Fantasy meets science fiction in Piranha Bytes' latest RPG. After tackling fantasy with the Gothic series, and the pirate tradition with Risen, the team at Piranha Bytes is taking on fantasy, science fiction, and the post-apocalypse all at once with its new game Elex—and we'll be able to see the results sometime this year. You watched nine minutes of the jetpack-toting RPG last year, and some newer footage out of the PC Gamer Weekender a few weeks ago, but you're probably wondering why laser rifles, swords and sorcery, and the end of the world are intermingling in the first place. 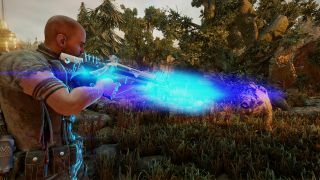 If so, you're in luck, as a new trailer has arrived to introduce and explain Elex's wacky premise. It's all to do with a comet that came hurtling towards the world of Magalan, ruining much of civilization and seeing the rise of three distinct factions: the Medieval-ish Beserkers, the science-minded Clerics, and the Outlaws. But the comet also brought a mysterious substance, Elex, that would give the Berserkers magical powers, the Clerics advanced technology, and turn the Outlaws into drug-addled Elex addicts. The most addicted were transformed into ferocious mutants, while more strong-willed users—the Albs, seemingly the main baddies of the game—were able to harness Elex and become super-human, at the cost of their emotions. There's still no release date for Elex, other than 'Q3 2017', so hopefully we'll get a firmer launch date soon.